You are here: Home / News / One was not enough. Second Inaugural Ball scheduled. One was not enough. Second Inaugural Ball scheduled. Gov. Reynolds at “Inaugural Fundraiser” in June, 2017. 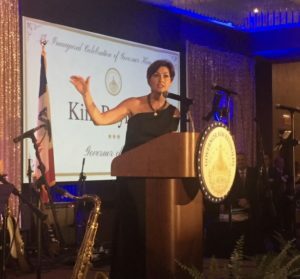 Due to “high demand,” there will be more than one inaugural ball to mark the start of Kim Reynolds’ first full term as governor. Tickets to an inaugural ball on Friday, January 18, 2019, sold out, so a second inaugural ball will be staged at the same time, in a building nearby in downtown Des Moines. Governor Reynolds and her husband, Kevin, will dash from one to the other. “So we make both of them a special and fun evening,” Reynolds said during a statehouse forum organized by The Associated Press. Crowds at both balls will see the governor in the same attire. “By trying to finish up a campaign, go into the Election, go into Christmas, try to be a good grandma for 10 grandchildren, to host Christmas and spent time with family and to babysit — because I haven’t had time to do that — we’re lucky I got a dress, let’s just say that,” Reynolds joked yesterday. In June of 2017, the Iowa GOP staged an “Inaugural Fundraiser” for Reynolds a week after she took over in the middle of Terry Branstad’s sixth term as governor.